So far David Grubb has created 14 blog entries. On March 15 several Sierra Club North County Coastal Group members met to discuss North County Coastal local cities overall environmental concerns, issues regarding North Coastal cities Climate Action Plans and Community Choice Energy possibilities. It was a great discussion that generated several areas of concern. Issues identified for Solano Beach included: Enforcement of City environmental policies regarding bag ban and commercial recycling, sea level rise and Solana Beach Climate Action Plan. For Oceanside issues identified included: Gregory Canyon, bag ban, habitat conservation plan, coastal development, sea level rise, Buena Vista Lagoon restoration, I 5/78 widening and interchange, protecting local farm land and Oceanside Climate Action Plan. For Encinitas issues identified included: Elections opportunity for progressive council membership in November 2016 with four seats open, polystyrene ban, Community Choice Energy, bike lanes, Encinitas Climate Action Plan update, waste and recycling of plastic, education/outreach to community around environmental issues. For Carlsbad issues identified included: Open space, water, development, Encina Power Station and Community Choice Energy. Regional issues identified in addition to the above included focus on Gregory Canyon with its plan for land fill development on top of the areas’ water aquifer, mandates without enforcement, San Onofre waste storage, Community Choice Energy creation of an alternative energy provider with possibility of a Joint Powers Authority for all North County Coastal cities, freeway widening versus regional transportation planning, huge development plans, Palomar Airport expansion, Coastal Commission direction and future of the Multiple Species Habitat Conservation Plan. It was decided for folks interested in pursuing addressing issues both on a local and regional basis, we would meet again in a month to discuss how we might come together to form a viable group that would be able to tackle some of these major concerns. For issues specific to Community Choice Energy, it was determined that the Carlsbad Action Team already working with Pete Hasapopoulos of the Sierra Club My Generation program would address specifically those issues. For the past several years, there has been a North County Coastal Group of the Sierra Club that addressed local issues, provided educational opportunities and a social forum for people who shared the same commitment and dedication to “exploring, enjoying and preserving” the treasured environment we so cherish in San Diego. The Sierra Club of San Diego would like to see that the North County Coastal members again have that opportunity to focus on their local issues and function as an active local Sierra Club group under the umbrella of the San Diego Sierra Club with all the backing of the National Sierra Club. To that end, we have scheduled another meeting at the Encinitas Community Center for Wednesday, April 20, 2016, 6:30-8:30 pm. We will have a short social time and then plunge in to figure out how we want to proceed to give North County Coastal Sierra Club members the best plan for reestablishing the North County Coastal Sierra Club Group focusing on local issues and raising our effectiveness in using the Sierra Club voice in the North County Coastal area. The Encinitas Community Center is at the intersection of Encinitas Blvd. Meet at 8:30 am at Doyle Park, 8175 Regents Rd, 2 blocks south of La Jolla Village Dr. for a 40 mi ride thru UTC, RSF & back by way of the coast & Torrey Pines. Leader: Hao Zhang, 858-354-3904. Difficulty Rating: over 35 mi, moderate hills, 14-16 mph average pace. Meet at 8:30 am at De Anza Cove, Mission Bay Park, for a 53 mi ride to La Costa and thru RSF & Carmel Valley with a snack stop. Joint ride with SD Wheelmen. Leader: Myles Pomeroy, 858-565-7262. Meet at 8:30 am in the Souplantation parking lot in Carmel Valley (3804 Valley Centre Dr, SD, 92130). Explore Carmel Valley into Rancho Santa Fe then loop around to the coast for our return route. Expect ~ 50 mi and moderate rolling hills, few regroups, and a brief ‘commercial’ snack stop towards the end of the ride. Leader: Dawn Nowlin, 858-254-8171. Meet at 9 am in the parking lot immediately north of the Mission Bay Visitor Center for a socially paced ride with fun and good friendship. We will ride to Cabrillo Point and along the harbor, including Harbor and Shelter Islands. Mostly flat, at a moderate pace, about 25 mi. Stop for coffee and food in route. A great way to celebrate the beginning of Father’s Day. This is a new leader evaluation ride. Evaluator: Ellen Scott. Leader: Lynn Reaser, 619-255-6819. Meet at 8:45 am at the Carmel Valley Park n Ride lot on Sorrento Valley Rd located just west of I-5 and just south of Carmel Valley Rd for a 39 mi ride along the SR56 bike path to scenic Rancho Santa Fe and Leucadia. There will be rolling hills with one longer climb on Leucadia Blvd. Coastal return with snack stop at Java Depot. This is an evaluation ride so I need at least 6 people to qualify. Evaluator: Myles Pomeroy. Leader: Cynthia Katz, 818-823-7099. WIN a HOBIE KAYAK or SPECIALIZED BICYCLE! Drawing June 20, 2015, need not be present to win. Click HERE to purchase tickets and more information. Sierra Club San Diego will host its annual Gala Awards Celebration to recognize the achievements of community leaders and Sierra Club volunteers in protecting the environment of our region. The event will include a reception from 6pm to 7pm, a silent auction, and dinner and awards program 7pm to 9:30pm. To purchase tickets go to the online store, call Richard at 858-569-6005, or email him at richard.miller@sierraclub.org. Sierra Club San Diego will host its annual Gala Awards Celebration to recognize and commemorate the achievements of community leaders and Sierra Club volunteers who have contributed their time and effort to protecting the environment of our region. The event will be held on Saturday, June 11, 2016 at the Hilton Harbor Island Hotel, 1960 Harbor Island Drive, San Diego, from 6pm – 9:30pm. The event will include a reception from 6pm to 7pm, a silent auction, and dinner and awards program 7pm to 9:30pm. This year’s theme is “Celebrating Partnerships”. The Sierra Club is not alone in fighting for the betterment of our environment. We stand together with other outstanding organizations that educate, advocate and make significant contributions to insuring San Diego’s treasured environment is enhanced and protected. The Gala will include the presentation of the Club’s FEAT (Friendly Environmental Action Taken) Awards recognizing organizations whose efforts help protect the environment, foster local solutions to global issues, help communities make sound environmental decisions about their own future and work to raise awareness of and advocate for climate change action. We will also be celebrating the 60th anniversary of our Wilderness Basics Course. This ten-week course on hiking, camping and backpacking attracts over 350 students annually where participants are taught skills to safely enjoy the wilderness. Our goal is to share our knowledge and skills in the safe enjoyment of wilderness areas and to convey a sense of responsibility for maintaining the purity and integrity of the wilderness environment. League of Women Voters of San Diego – in recognition of their work of educating and enabling the citizens of San Diego to act as guardians of the environment by raising awareness and advocating for action through the democratic process. Cleveland National Forest Foundation – in recognition of their commitment to sustainable regional land use planning and advocating for sensible and achievable regional Climate Action Plans. California Solar Energy Industries Association, San Diego Chapter – in recognition of their work raising awareness and advocating for climate change action and in helping the City of San Diego commit to a future of 100% renewable energy. Our outstanding cadre of volunteers, who make Sierra Club San Diego one of the most impactful environmental organizations in San Diego, will also be recognized. This year the Chapter will recognize ten awardees for their hard work and dedication. Rookie Activist of the Year – Siyuan Liu and Alejandro (Ale) Montes. The Rookie Activist Award honors an individual who has recently begun to shine as an activist. It is vital that, each year, new volunteers keep the Chapter’s tradition of volunteer activism going strong. This award recognizes the importance of “rookies” to the Chapter. Both Siyuan and Ale have been student interns and represented the Chapter at the Sierra Student Coalition SPROG, a grassroots leadership training program that teaches tools for environmental and social justice activism to young folks across the country. Outings Leader Award – Lynn Nebus. The Outings Leader Award recognizes a Chapter Outings leader who has done outstanding work in outdoor leadership and education. As stated in the Chapter Strategic Plan, the Outings Committee takes the lead in providing safe, enjoyable, and informative outings opportunities. The first experience with the Chapter of many members and volunteers is on a Chapter outing. Lynn is a Certified Outings Leader who has been active in the Outings program for over 20 years serving in many leadership positions. Political Activist Award – Debby Knight. The Political Activist Award is presented to the person who has done outstanding work to further the Club’s political mission to preserve the environment through grassroots, bipartisan, political action and elect environmentally supportive candidates. Debby is the longest serving volunteer on the Chapter Political Committee and has often taken a lead role in the endorsement process and been actively engaged with Sierra Club endorsed candidate campaigns. Volunteer of the Year Award – Suzi Sandore. The Volunteer of the Year Award is presented to the volunteer who has done outstanding work in furthering the Club’s overall mission. Volunteers bring enthusiasm and dedication to their efforts for the Chapter. They benefit the Club greatly and this award recognizes and publicizes their efforts. Suzi currently serves as Chair of the North County Group and engaged in their Wilderness Basics Course. She has been instrumental in organizing Sierra Club members for volunteer activities, such as creek clean-ups and vegetation restoration projects. Club Service Award – Sierra Social Section. The Club Service Award celebrates the achievement of one of our sections that has provided exemplary service to the Club. The volunteers who help with the various tasks needed to support our members and activities are the true unsung heroes of the Club. The Sierra Social Section is the Chapters most active group and took the lead to reestablishing the Chapter monthly program – Sierra Talks. Special Service Award – Rob Morris. This Special Service Award like the Club Service award is presented to an individual that has provided exemplary service to the Club. Rob has served as the Chapter Treasurer since 2013 and has contributed enormous time and talent in helping the San Diego Sierra Club. Distinguished Achievement Award – Mike Bullock. The Distinguished Achievement award recognizes the member who has exhibited a sustained level of service and commitment to our overall mission. It honors the person who year after year has contributed their time and knowledge and passion to help the Club achieve its goals. Mike is the Chair of the Chapter Transportation Committee and was instrumental in helping us win several lawsuits in providing his expertise on how auto emissions effect climate change. Lifetime Achievement Award – Mike Fry. The Lifetime Achievement Award honors an individual who has provided distinguished service to Sierra Club San Diego for a significant period of time. It is these types of individuals who have given their life time experiences and leadership to make the Sierra Club the best that it can be. Mike has been an active member of the Club and Outings program for almost 50 years. He is a Certified Outing Leader and has served in leadership positions including Chapter Executive Committee, Chair of the Ski Section and Bus Trips. Silver Cup Award – Joe Zechman. The Silver Cup award is the Club’s highest award and is presented to the person who has most significantly contributed to the success of the Club’s mission. This is an award that recognizes efforts that not only represent a significant commitment by the volunteer but also has resulted in a significant contribution to the Club. Joe most recently served 2 years on the Chapter Steering Committee and served on the Chapter Executive Committee for six years, twice as Chapter Chair. Joe was active in the Sierra Singles (now the Sierra Social) Section and served on numerous Chapter committees and task forces in leadership positions. GALA AUCTION. Another highlight of the Gala is our annual auction. The big prize this year will be a 6 day South African Photo Safari (see separate article). Past auctions have included museum and theater tickets, guided desert flower tours, hotel weekends, restaurant certificates, sports tickets, wine tastings, spa treatments, kayaking, paintings, collectibles and more. Do you have a service or business that you would like to promote or an item of value that you no longer need? Then donate it for our auction! To donate an auction item call Richard at 858-569-6005 or email him at richard.miller@sierraclub.org. Individual Tickets – &75 includes reception and dinner. Sponsorships – $500 to $2,000 call the office for details. To purchase tickets go to the online store, call Richard Miller at 858-569-6005, or email him at richard.miller@sierraclub.org. Gala Auction to Feature South African Photo Safari! This may be your chance to finally take the vacation you have always dreamed about. The biggest prize for the Gala auction will be a six day, six night African photo safari with luxury accommodation for two people at Zulu Nyala Luxury Hemmingway Tented Safari Camp, Heritage Safari Lodge, or Game Lodge situated in the heart of South Africa’s Zululand conservation region – one of the richest conservation regions in Africa. It includes full board – that means three delicious meals per day, prepared by the finest international chefs – with an African flavour, of course. There will be two game viewing activities per day guided by professional game rangers in open game viewing vehicles. Additionally a personal ranger that will assist you in arranging your activities during your stay at Zulu Nyala. The auction safari does not include airfares, transfers, side trips, drinks, telephone calls, laundry and gratuities. The safari certificate will be valid for two years from the auction date. Sierra Club is a 501(c) (4) non-profit organization, tax ID # 94-1153307. Contributions or gifts to “Sierra Club San Diego Chapter” are not tax deductible; they support our effective citizen based advocacy and lobbying efforts. Meet at 8:30 am at the northeast corner of Linda Vista Rd and Via Las Cumbres (parking available on Via Las Cumbres and in the County Board of Education parking lot) for a 43 mi ride north past SR 56 to Carmel Valley Rd, then west to the coast. Snack stop. Rain cancels. Leader: Myles Pomeroy, 858-565-7262. On the 3rd and 4th Sunday of each month, join us for the Sunday Ride starting from Mission Bay. Meet at 9 am in the parking lot immediately north of the Mission Bay Visitor Center. Route & leaders vary each week. Come for the social pace of this ride. Leader: Ron Manherz, 858-587-0272. Meet at 8:30 am at DeAnza Cove in Mission Bay Park for a 40 mi ride north, then inland as temperatures permit and back along the coast. Rain cancels. Leader: David Johnson, 858-483-5877. Difficulty Rating: 21 to 35 mi, moderate hills, 12-14 mph average pace. Meet at 9:30 am for a Memorial Day ride. Bring you bathing suit if you want to cool off after the ride. Afterward the ride, we’ll fire up the grill and pig-out on the patio. Bring something to grill, your own drinks and a side dish or desert to share. Call leader one week in advance for start location. Leader: Marty Hambright, 858-587-0272. The 1st, 2nd & 5th Sunday of each month, meet at 9 am at the Carmel Valley Community Center, 3777 Townsgate Drive, across the street from the Del Mar Highlands Shopping Center, 1/2 mi E of I-5. Route & leaders vary each week. Come for the social pace of this ride. Leader: Ellen Scott, 619-405-4819. Meet at 8:30 am at the Encinitas Coaster Station located at East D Street and Vulcan for a meandering, hilly 45 mi ride through Encinitas, Carlsbad and Oceanside with a snack stop. Joint ride with San Diego Wheelmen. Hot temps changes to all coastal route. This ride avoids the congestion associated with the Rock ‘n’ Roll Marathon. Leader: Myles Pomeroy, 858-565-7262. Meet at 8:30 am at DeAnza Cove in Mission Bay Park for a 40 mi ride north, then inland as temperatures permit and back along the coast. Rain cancels. BE ADVISED THAT THE ROCK ‘N’ ROLL MARATHON WILL IMPEDE TRAFFIC ON EAST MISSION BAY DRIVE, SEA WORLD DRIVE AND MORENA BL but the DeAnza Cove parking lot will be accessible from the north. Leader: David Johnson, 858-483-5877. Fighting for what we value is a huge expense, even though many experts, scientists, lawyers and volunteers provide their services to the Sierra Club for free. Your financial support enables the Sierra Club San Diego to continue working on your behalf for the environment. In times like these, conservation is especially important to prevent irresponsible decisions that endanger our health and our natural world. We must act now if we are to ensure a future that includes clean air, clean water, open spaces and abundant native wildlife, the issues that define our quality of life. Your contribution will support the grassroots actions needed to protect and improve our environment. Even a very small donation – $5 or $10 – is important to our work. Come join friends and fellow Sierrans for a wine tasting social event and fundraiser for Sierra Club San Diego. We are fellow members like you that gather to enjoy and learn about wines all while having the opportunity to engage in conservation and hear about Sierra Club programs. Of course, it is also about meeting new friends, old friends and just plain FUN. 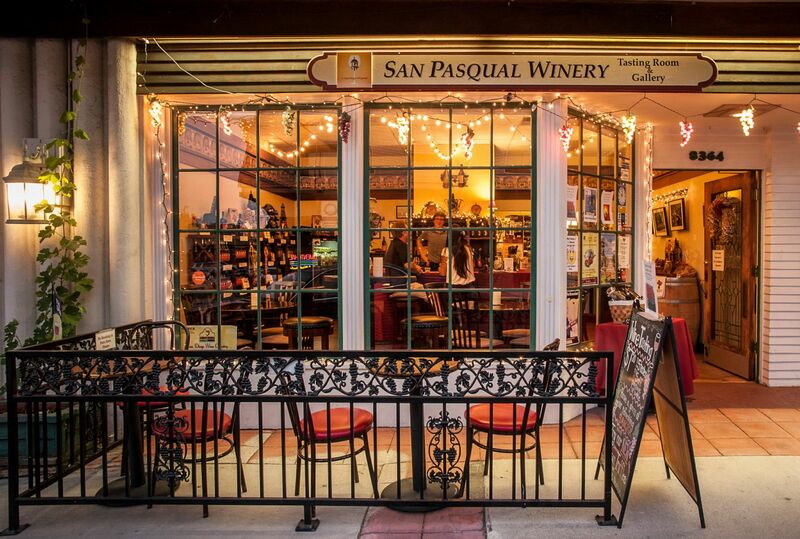 Come join us at San Pasqual Winery, in the heart of downtown La Mesa at 8364 La Mesa Blvd. We will enjoy a flight of 8 wines that you select from a list of about 12 choices, including a variety of white, red and fruit wines. This will be accompanied by plates of selected cheeses and crackers. Additionally, San Pasqual Winery will donate 20% of all bottle sales from the event to Sierra Club San Diego! All members and their guests are invited to attend and is open to the public. Space is limited and of course you must be of legal drinking age. Cost is $30 per person. This will cover all expenses and includes a small donation to Sierra Club San Diego. To make your reservations and purchase tickets, go to http://donate.sierrasd.org/ . If you would like to pay by check, please call the office at 858-569-6005 to make your reservations and mail checks, payable to Sierra Club, to Sipping Sierrans, 8304 Clairemont Mesa Blvd, Ste. 101, San Diego, CA 92111.